Proc. Amer. Acad. Arts 3: 274. 1856 et: in Pacif. Rail. Rep. iv. 29. t. 2. f. 3-5. 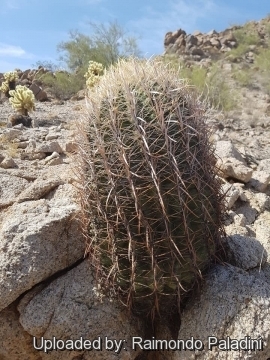 Habitat: This cactus is locally abundant in arid gravelly or rocky foothills, canyon walls, fans and wash margins at 600 to 1250m elevation among creosote bush scrub, it also utilizes slopes and Acid Igneous rock lands. The species is limited in its northwards range by frost conditions. To reduce the damage by frost the plant is found on south facing slopes and it leans to the south to protect the sensitive growing tip by placing it for best exposure to the sun . Echinocactus wislizeni var. lecontei (Engelm.) Engelm. Ferocactus acanthodes var. lecontei (Engelm.) G.E.Linds. Ferocactus acanthodes f. albispinus hort. Ferocactus acanthodes f. variegatus hort. 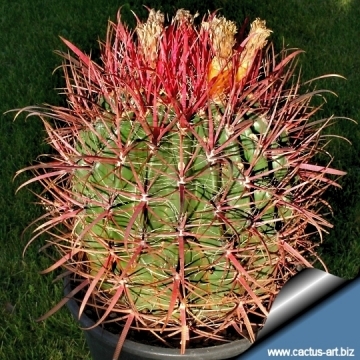 Ferocactus cylindraceus var. hertrichii (Weinberg) hort. Echinocactus hertrichii Weinberg & Werderm. in Backeb. Ferocactus acanthodes var. hertrichii (Weinberg) hort. Ferocactus acanthodes var. tortulispinus (H.E.Gates) G.E.Linds. Description: Ferocactus lecontei along with Ferocactus tortulispinus, and Ferocactus rostii is one of the old controversial geographical forms of the variable Ferocactus cylindraceus = (Ferocactus acanthodes). The plant is usually unbranched forming a single column up to 2 m tall and 30 cm in diameter. The ribs are 2,5 cm high and tuberculate. 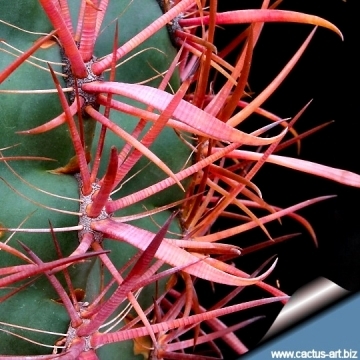 Ferocactus acanthodes is differentiated between variety lecontei with an untwisted, non-hooked central spine 5-7 cm in length, often closely pressed to the stem, and variety acanthodes with a central spine 7-15 cm in length. The former grows at higher elevations 700-1500 m in elevation, while the latter usually inhabits the 50-700 m elevational range. 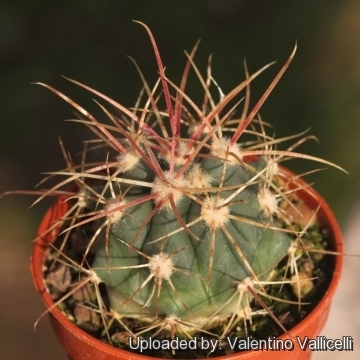 However it look very similar to other varieties of Ferocactus cylindraceus which are linked one to each others by populations of plants with intermediate characteristics. Nowadays all them are thought to belong to a unique polymorphic species. Such variations has led to establishment of several unnecessary names for this species. 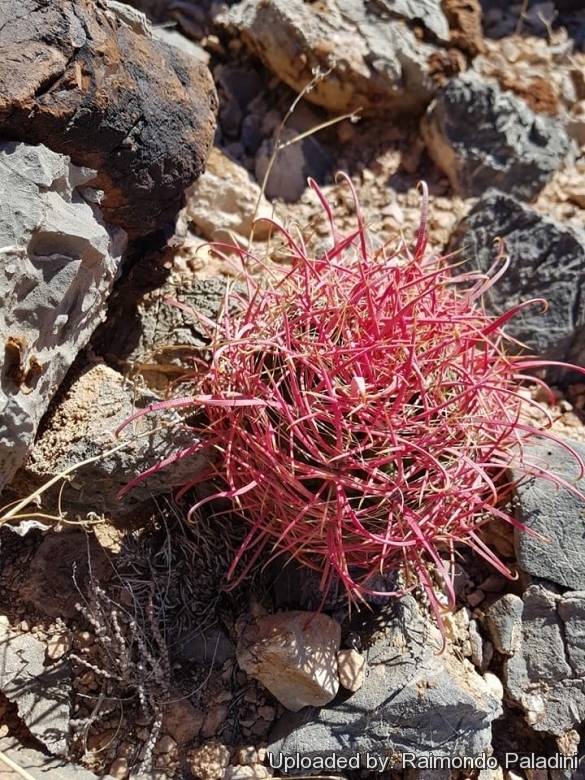 Ferocactus lecontei shows a large range of variability in spine colour (whitish-grey, yellow, pink, reddish, purplish or brown) some plants have long, strong central spines while other have shorter. The variability in spination of plants from different populations and within the same population too, may be considerable. Spines: A large central spine and three auxiliary centrals form a crucifix shape, The primary central is 5 to 7 cm, angles down and is slightly to moderately hooked, sometimes to 90 degrees. The other centrals are from 5 to 7,5 cm long. The centrals are noticeably annularly ridged and flattened with a flat upper surface and rounded lower surface. Spines can be very light grey to purple-red and yellow but darken to black with age. Flowers: Yellow flowers tinged with red appear in May and June at the crown of the plant, 4 to 6cm. The fruit with scales is fleshy, yellow or yellowish green 5 cm long, 2,5 cm in diameter. Ferocactus acanthodes f. albispinus hort. : White spined type. Selected cultivated form. Ferocactus acanthodes var. rostii (Britton & Rose) W.T.Marshall: has columnar stems up to 3 m high and 30 cm in diameter. It is similar to F. acanthodes, but the stem is thinner and the spines are more curved and blanch to golden in maturity. Distribution: Texas and California. Ferocactus acanthodes f. variegatus hort. : varigated form. 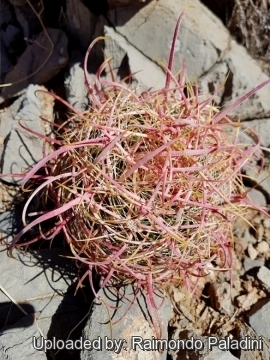 Ferocactus cylindraceus (Engelm.) Orcutt: Colourfull barrel cactus forming in age a mound of thorns and then a narrow column up to 2m tall, with attractive curved spines that partly obscure the green stem. The spine colour is red but also yellow or pale grey. Distribution: southern California, southwestern Arizona, northern Baja California, and northwestern Sonora. Ferocactus cylindraceus subs. eastwoodiae (L.D.Benson) N.P.Taylor: Plants solitary, short to tall cylindrical up to 3 m high and 30 cmin diameter. Spines dense, partly obscuring the stems, yellowish to straw colored. Distribution: restricted to central Arizona and the Grand Canyon. 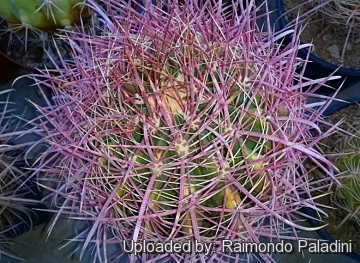 Ferocactus cylindraceus var. hertrichii (Weinberg) hort. : Usually unbranched forming a single column up to 2 m tall and 30cm in diameter. It has a large central spine and three auxiliary centrals form a crucifix shape. Ferocactus cylindraceus subs. lecontei (Engelm.) N.P.Taylor: Plant with untwisted non-hooked central spines 5-7 cm in length often closely pressed to the stem; Distribution: southern Nevada, southwestern Utah, southern California, and much of Arizona. Grows at 700-1500 m in elevation. 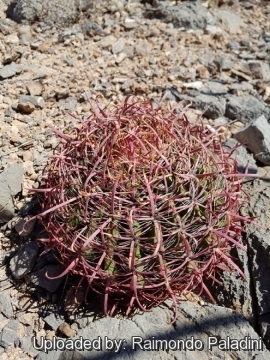 Ferocactus cylindraceus var. tortulispinus (H.E.Gates) Bravo: It has much shorter stems, often with flattened tips. the spines are very twisted gray. Distribution: northern Baja California. 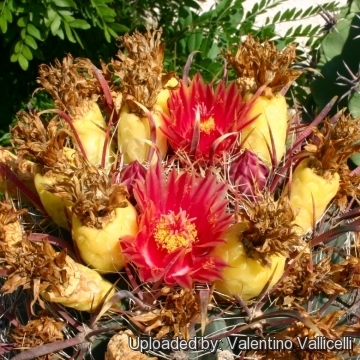 Cultivation and Propagation: Ferocactus lecontei are summer-growing and pretty easy plants. Growing rate: Thought slow to start the speed when they reach about five cm in diameter. Plant in good conditions will start to bloom when reach the diameter of only 15-18 cm. Soil: They are suited for any rich, well drained soil such us clay, pumice, lava grit, and only a little peat or leaf-mould. Repotting: If potted, repot them preferably in the spring, if their roots become cramped. Generally, they should be repotted every other year in order to provide fresh soil. However, this doesn't necessarily mean they'll need larger containers. Fill about a quarter of the pot with broken crocks, gravel, etc. to promote good drainage. After repotting, do not water for a week or more. Watering: Water regularly during the aestival growth cycle (this plant need plenty of water, but do not overwater and let their soil dry out between waterings), and also needs to be avoided wetting the body of this plant while it is in sunlight. A wet cactus in the sun light can cause sun burning which can lead to scars or even fungal infections and death, keep rather dry in winter. No water should ever be allowed to stand around the roots. Exposure: Outside they need a bright exposure, full sun or half shade in summer if the location is exceedingly hot or bright, inside needs bright light, and some direct sun. It can tolerate moderate shade, and a plant that has been growing in shade should be slowly hardened off before placing it in full sun as the plant will be severely scorched if moved too suddenly from shade into sun. Frost Tolerance: Light frost protection required for safe cultivation, but can tolerate sporadic light frost. This plants need a period of cool rest in winter to produce flowers abundantly. Diseases and pests: Watch for infestations of mealybug, scale insects and spider mite. Propagation: Seeds are the only way of reproducing. Seed Collecting: Permit fruit to ripen. Fruit must be significantly overripe before harvesting seed; clean and dry seeds.